Love natural beauty products but feel like you want to try something new? Biobeb have launched a new skincare range suitable for all skin types, that’s got it all covered. Their natural range includes a De Age Anti Wrinkle Cream, a Mega Bright DNA Repair and a DNA Repair Cell Serum. Using exclusively the best natural ingredients available, these luxury products keep the skin healthy and fresh whilst also removing dead skin cells, blackheads and dark spots. I tried the De Age Anti-wrinkle, an instant line corrector that you can use daily as your cream or as an additional treatment. The first thing I noticed was that the texture felt almost like a mousse or souffle: it’s light and rich at the same time, and it absorbs easily into the skin. It contains an anti-aging formula with stabilised enzymes that helps to repair skin damage due to sun exposure (which believe it or not occurs even when it’s cloudy!) and it promotes wound healing by reducing wrinkles and scar formation. Another hero ingredient used in this cream is hyaluronic acid, which helps to hydrate the skin by prolonging moisture to the epidermis and helping your skin to look firmer. All in all, it’s a wining formula and a great product that you can feel safe using. “We stand behind the effectiveness of our brand 100%. This product was developed based on the physical testing of our products over a period of 12 months. The testing was done by dermatologists, volunteers and industry beauty experts. Feedback has showed us that many women will not only use our brand, but they will be glad to recommend it to their friends. The main reason stated was the quality of our ingredients.” CEO of Biodeb UK Ltd.
Ibeba natural products contain NO PARABEN, ALCOHOL AND MINERAL OIL. For more information go to www.ibeba.co.uk. 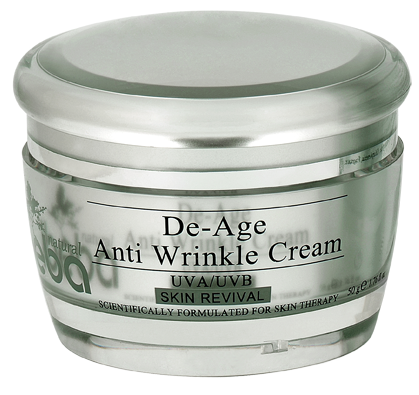 The De Age Anti Wrinkle Cream (50g) is priced at £28.95. This entry was posted in Skincare and tagged antioxidant, Ibeba, Natural, organic, skin revival de-age anti-wrinkle cream. Bookmark the permalink.